Liberty Lutheran Services has been awarded a 2017 Top Workplaces honor by Philly.com, ranking top ten in the category for large employers. Doug Claffey, who leads WorkplaceDynamics, the research firm that administered the survey, explained that the survey measures the strengths of an organization’s culture through the people who know it best. “To be a Top Workplace, organizations must meet our strict standards for organizational health. And who better to ask about work life than the people who live the culture every day—the employees,” he says. “Time and time again, our research has proven that what’s most important to them is a strong belief in where the organization is headed, how it’s going to get there, and the feeling that everyone is in it together. Without this sense of connection, an organization doesn’t have a shot at being named a Top Workplace,” added Claffey. I am able to improve and grow in my position and my knowledge base. My boss shows me how to learn and grow, and encourages me to better myself. I work with an amazing team and could not ask for better people to work with. I get to make a difference in people’s lives. I feel like I am appreciated and valued. Friendly staff. Caring managers. I believe I make a difference here. My colleagues are fabulous and we get to interact with the individuals that we serve. I am supported by management and my team members to perform at my best ability. I am given the resources to practice with integrity that best meets my patients’ needs and gives me a sense of pride. It is a positive work environment where we strive to grow the business but understand the importance of enjoying your job. We work as a team and support each other in good and bad times so we all achieve success. I make a difference in the lives of the residents and have an amazing nursing staff that I get to be a part of. I can make a difference in the life of seniors. I feel that I am supported and valued for the work that I do. Upper management does care about their employees even when difficult decisions need to be made. Much thought and care goes into the decision-making process. For more information about the Top Workplaces 2017 awards, visit www.topworkplaces.com. For more information about Liberty, visit libertylutheran.org. Liberty among Phila-area healthiest employers 2nd year in a row! Wellness Works Coordinator John Fairchild and Liberty’s AVP of Human Resources David Brown at the PBJ Awards Ceremony. Liberty Lutheran is one of the Healthiest Employers of Greater Philadelphia for the second year in a row, according to the Philadelphia Business Journal. Liberty was recognized at an awards breakfast on June 4, 2015 for creating a culture of health in the workplace, while improving lives and cutting healthcare costs, along with several other Philadelphia-area employers of various sizes and industries. Liberty was among 13 organizations that received the honor in the 500-1499 employee category. Liberty at Home Operations Manager, Bobbie Arias, is one of many staff members participating in the transformational challenge this year. This challenge was developed to keep employees consistently motivated through the entire year, with the goal of changing body composition through activity, exercise, nutrition, less stress and being well-rested. As Wellness Works Coach John Fairchild explains, the “transformational challenge” is not so much about weight loss, but rather promotes improvements in body mass index, also known as BMI. Liberty ranked as Top Workplace! Our employees are our greatest resource and thanks to them – Liberty has been named as one of the top 100 best places to work in Greater Philadelphia in 2015! And as if that’s not great – there is even better news to report. 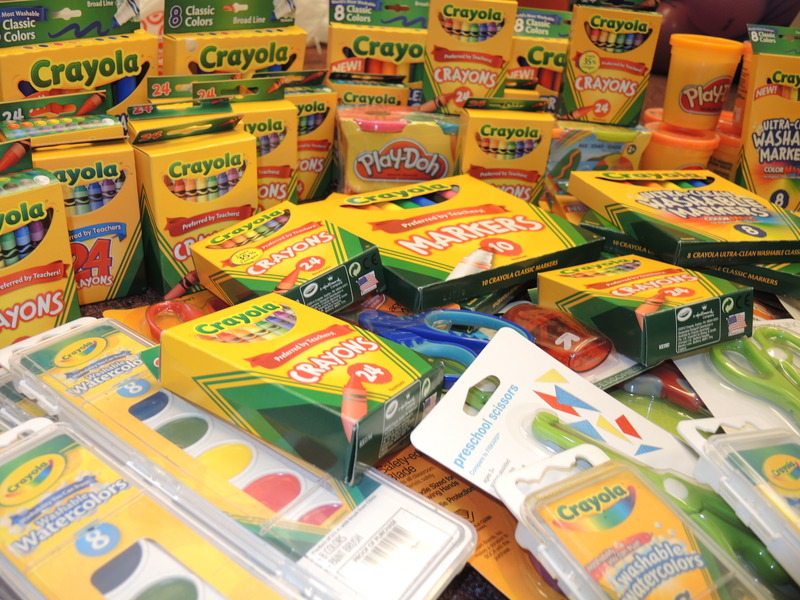 Supplies collected to benefit children affected by disaster. Our friends and colleagues at Artman and The Becoming Center have opened up their hearts for a special cause this summer. Their efforts will aid in the healing processes for 50 children affected by disaster. Liberty Wellness Coordinator John Fairchild and Wellness Coach Kelli McIntyre with the award at a June banquet.